Two big problems this June traveling season: peaking petroleum prices and darting deer. There&apos;s not much we can do about the price of gas, but Dennis Hughes, chief of safety programs for the State Patrol Bureau of Transportation Safety , Department of Transportation, warns motorists to be on the lookout for deer, especially during this month of June. Hughes says there are tens of thousands of vehicle-deer crashes every year, but it&apos;s hard to know an exact count because many hits don&apos;t get reported. "We know that we have a record of about 18,000 deer hits. The DNR, for example, has a record of carcass removal that&apos;s somewhere over 40,000 a year." October and November are the peak months for the number of vehicle-deer crashes. But June is tops for injuries due to deer crashes. Hughes says that&apos;s mostly because more motorcycles are on the roads in the summer. In fact, motorcycles were involved in 10 of the 14 fatal vehicle-deer crashes in the Badger State last year. Hughes advises deer are most active in early morning and evening hours, watch for deer warning signs, don&apos;t speed, wear your seatbelt, if you see one deer there are likely more. If you do see a deer on or near the road, blow your horn to frighten the animal away. "Break firmly when you see a deer in or near your path. What we really don&apos;t want you to do is swerve. 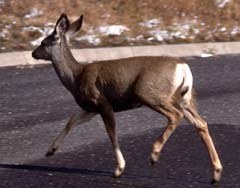 Swerving your vehicle can confuse the deer as to where it should be going. But more importantly, it can cause you to lose control and go off road left, off road right, both of which can be pretty dangerous maneuvers." Deer are active in June partly because the doe is looking for a place to give birth and the yearlings are straying from their mothers for the first time. According to the state DOT, deer are the third most common objects struck by drivers, behind only other vehicles and fixed objects.